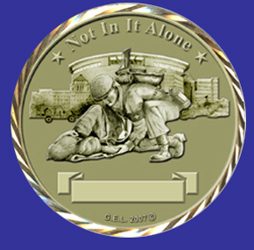 1.75" antique silver coin with swirl cut depicting “Not In It Alone” BAMC image. $10 includes s/h. Contact George for further information. Contact George for current scheduling. © 2003, 2012 All rights reserved. Portions of this website may be used only with permission of George. Site maintained by Joseph .